Aerie, the American Eagle loungewear collection that has committed to celebrating all bodies through Photoshop-free campaigns and an inspiring crew of spokespeople, is growing its girl gang of #AerieREAL Role Models. 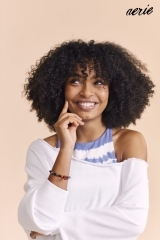 The brand announced that three dynamic women would be joining model Iskra Lawrence as ambassadors for the Spring 2018 campaign: U.S. Olympic gymnast Aly Raisman, Grown-ish actress and activist Yara Shahidi, and singer Rachel Platten. Check out a few shots from the #AerieREAL Spring 2018 campaign in our image gallery.